Columbia has a great range of affordable and durable winter boots available. Of all their styles, the Bugaboot is one of their most popular and versatile winter boot styles. The Bugaboot is available in both men's and women's sizes. The Columbia Bugaboot Plus II. More info & prices at Amazon. There are several styles of Bugaboot’s available. For winter use, the Bugaboot Plus II and the Bugaboot Plus II XTM are the best for cold weather due to their superior insulating ability. The traction provided by both styles of Bugaboot Plus II’s is excellent. Both use a specialized non-marking compound called Omni-Grip that has a winter-specific lug tread pattern for maximum traction in the snow. Both Bugaboot styles also share a same design. The upper consists of full grained leather that is oiled and waterproof. The mid-sole is constructed from Techlite, which allows the boot to remain light while still providing excellent shock absorption and cushioning. A cushioned EVA footbed, which is removable, provides support. Finally, and most importantly, both the Plus III and the Plus III XTM use Columbia’s specialized Omni-Heat insulation. Omni-Heat consists of two parts—the insulation and a reflective lining. The insulation is similar to Thinsulate and is fully breathable. The reflective lining works by reflecting body heat back to the foot, thus trapping heat inside of the boot instead of letting it escape. The differences between the Plus III and the Plus III XTM basically come down to temperature rating and weight. The temperature ratings of each boot are shown below. Additionally, the Bugaboot Plus III XTM weighs a few more ounces than the Plus III due to the extra insulation. Also, Columbia still makes the "Original Bugaboot." This boot is similar to the Plus III, except that it contains less insulation (100 grams instead of 200 grams) and doesn’t have a specific temperature rating. With just half the insulation value, the boot will likely only keep feet warm down to around 0 degrees (and maybe not even that). Thus, if you plan on spending significant time outdoors in cold weather, get the Plus III instead of the Original. Overall, the Bugaboot Plus III styles of boots are excellent all-around boots for winter use. They are warm, easy to slip on and provide superb traction. Keep in mind that in order to utilize their full insulating ability, a quality winter sock (never cotton) should be used. Additionally, the boots are winter boots and not snow boots—mainly due to their lack of a snow gaiter and somewhat shorter shaft height (read article about difference between snow boots and winter boots). If you plan on wandering through deep snow frequently, either get a dedicated snow boot (such as those made by Sorel or Baffin) or purchase a separate snow gaiter. 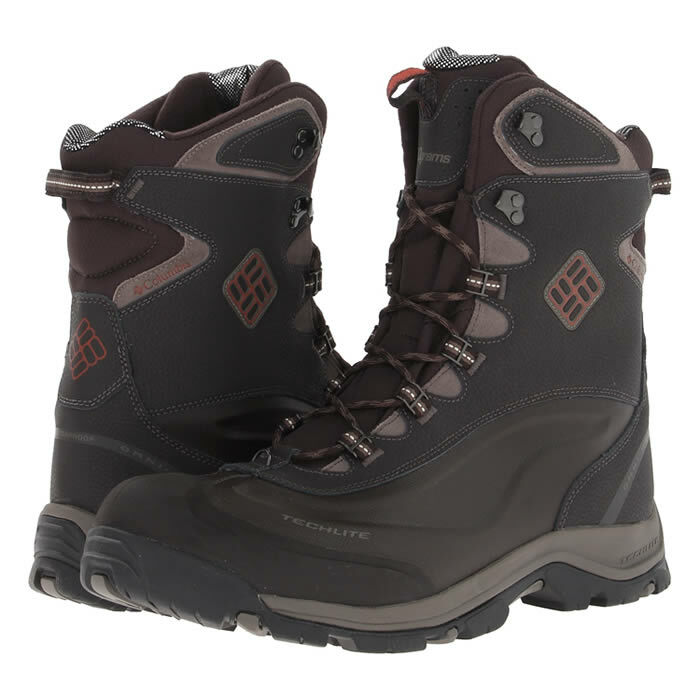 Columbia Bugaboots Plus III's are widely available online, as well as offline in stores located in northern climates. The prices for the Bugaboots vary, based on which style is chosen. Another excellent place to buy Columbia winter boots, including the Bugaboot line, is through Columbia itself. Other online retailers where the boot is often available include Moosejaw, REI.Com, and Shoes.Com. Temperature Rating : -25 degrees (Plus III), -65 degrees (Plus III XTM). Weight : 1 lb 6 oz for Plus III, slightly more for Plus III XTM. Sizes Available : All sizes for both men and women, in both whole and half sizes. Note, during peak periods, some sizes are quite difficult to find. Other Notes : For both men and women. Versatile. An excellent all-around winter boot. Warm. Rated to -25degrees (Plus III) and -65 degrees (Plus III XTM) Fahrenheit. Super traction that is specifically designed for snowy and icy conditions. Relatively easy in/easy out compared to other similarily tall winter boots.